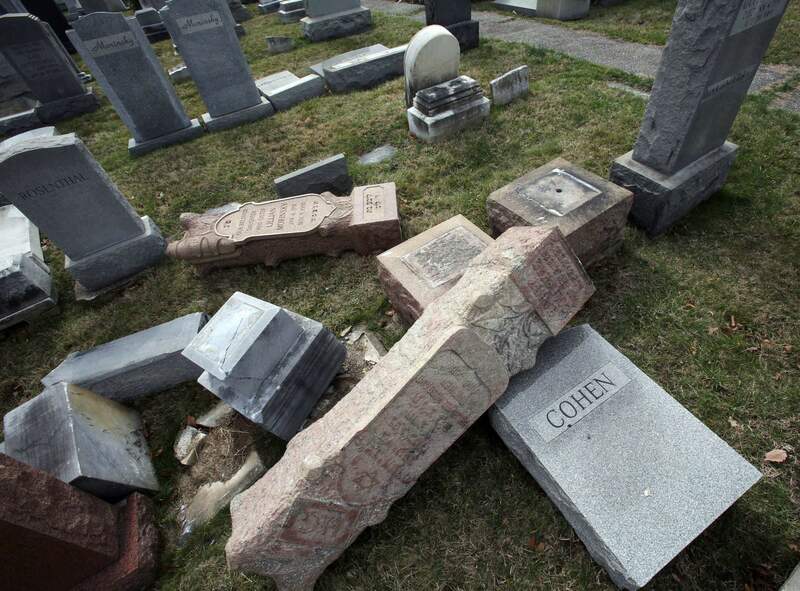 Headstones toppled and damaged by vandals lie on the ground at Mount Carmel Cemetery in Philadelphia. The Anti-Defamation League is reporting a 57 percent increase in anti-Semitic incidents in the U.S. in 2017. The Anti-Defamation League is reporting a 57 percent increase in anti-Semitic incidents in the U.S. last year, the highest tally that the Jewish civil rights group has counted in more than two decades, according to data it released this week. The New York City-based organization found 1,986 anti-Semitic incidents last year, up from 1,267 in 2016. That’s the highest total since 1994 and the largest single-year increase since the group began collecting this data in 1979. The ADL said the sharp rise includes 952 vandalism incidents, an increase of 86 percent from 2016. The group also counted 1,015 incidents of harassment, a 41 percent increase from 2016. “Less civility has led to more intolerance,” he told The Associated Press. Greenblatt also acknowledged that heightened awareness of the problem likely led to increased reporting of anti-Semitic incidents. Anti-Semitic incidents at schools and on college campuses nearly doubled for the second consecutive year, with 457 such incidents reported in non-Jewish schools last year, the ADL report says. “We should see this as an alarm, a very loud alarm that should get the attention of all of us,” Greenblatt said. The ADL and other groups have reported a surge in the number of incidents in which far-right extremist groups have posted racist and anti-Semitic flyers on college campuses. ADL spokesman Todd Gutnick said the report’s tally only counts incidents in which flyers had explicitly anti-Semitic messages. The ADL also counted 19 anti-Semitic physical assaults last year, a 47 percent decrease from 2016. The harassment incidents included 169 bomb threats against Jewish institutions, nearly all of them by two men. The ADL report said more than 150 bomb threats against Jewish community centers and day schools last year were allegedly made by an 18-year-old Israeli-American Jewish hacker, who was arrested in Israel last March. Separately, a former journalist from St. Louis pleaded guilty to making a string of fake bomb threats to Jewish organizations last year in the name of his ex-girlfriend in an effort to disrupt her life. There were six incidents in which Jewish institutions were victims of vandalism and harassment for their purported support of Israel, Gutnick said. The ADL is urging Congress to pass legislation to expand federal protections against bomb threats to religious institutions. The legislation, approved by the U.S. House of Representatives in December, awaits action in the Senate, the ADL said. President Donald Trump was widely criticized for saying there was “blame on both sides” after violence erupted in August at a white nationalist rally in Charlottesville, Virginia, where 32-year-old Heather Heyer was killed when a man drove his car into a crowd of demonstrators. Greenblatt said Trump’s statements about the rally were a “serious failure of moral leadership” and a “low point” of his presidency. “There’s no question we would love to see the president call out anti-Semitism as consistently and clearly as he does other issues,” Greenblatt said. “We just don’t report something we’ve heard. We call, we check and we verify,” Greenblatt said.